Presenting part 3 of 8 of our series on Conjuration and Spirit magic for beginners. Today we'll talk about scrying. Last week we posted the a series of book recommendations and information on setting up a devotional practice to develop support in the spirit world. Today we're introducing scrying. Tomorrow we'll begin with more and more exciting topics more directly reflecting the work itself. So please like us on Facebook, and share the post with your friends so that can enjoy it as well. A few months back while Rufus Opus was visiting I was giving a class on spirit magic at William Blake Lodge. Rufus attended and he got to to see my approach to working with Trithemius in the ritual which followed the lecture. In addition to Rufus being there, one of my friends who has an interest in magic but as of that time no real experience, also came along. After the ritual everyone was a-buzz with their excitement over things they saw in the crystal and the new information and insights they received. Everyone except my friend who tagged along. He clearly felt awkward over the fact that he got nothing. Not because of inability to connect with spirits, but because he not only didn't know how to scry, he didn't know what it is. Scrying is one of the things magicians think of as a very basic skill, and so you don't see it treated thoroughly all the time. It is however a very diverse skill with many applications and it is essential when one chooses to work in crystallomancy. So I figured we'd talk about the basic idea, and some resources and exercises. Scrying relates to many elements of contemporary magical training as well as to many elements of mentalism or psychic activity. People most often define scrying as “gazing” and discuss it as an act in which one looks into something such that they lose focus in their eyes and eventually open up to seeing with the “third eye.” This is not a completely inaccurate description, it is a part of it, but it also might imply that it's like looking at a magic eye book, in which we relax our focus and allow our eyes to see things in an unconventional manner so that we can trick ourselves or see secondary images hidden in things. Scrying isn't an optical illusion. Scrying is about a connection beyond sensory and temporal-spatial modalities. The act of gazing allows the mind to settle and subdues visual focus, but it also creates a mental focus on the object being scryed. The scrying device becomes a means for creating a connection between the magician and the actual object of his observation. 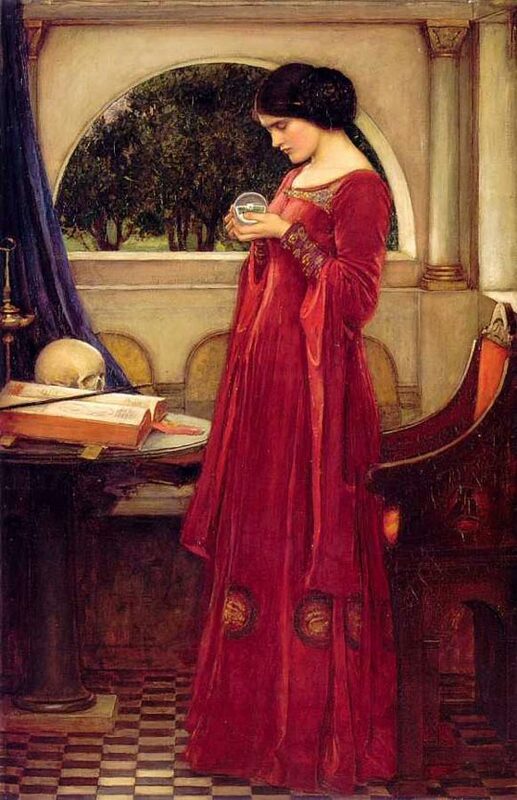 Consider common scrying devices, a crystal ball, a mirror, a bowl of water, a vessel of ink, a candle flame, or steam smoke or mist. They might not seem exceptionally similar but there are certain similarities. For one several of them are things with clear elemental links, a bowl of water, a stone, fire, and cloudy air. The mirror and the ink are essentially alternatives to the stone and the water. When we consider the crystal, the water, and the mirror they all have physical properties which impact light, these properties have to do with the structures of the materials in question, which all have their own particular specialness. Water's molecules are set up to make it the perfect solvent, the ability to dissolve implies this ability to connect various things into a singular interconnected moment. Crystals have a very ordered structure which allows for multiple ordered connections within the crystal, again reflecting the ability to create connections. The flame is literally light and energy being released from matter in a way which interconnects the four elements. Clouded air similarly overlaps elemental states, either air and water, potentially by way of fire, or air and earth by way of fire. 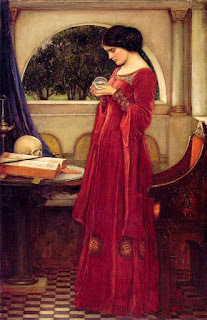 Common scrying devices are therefore objects which reflect states of being in between and states of connection, these are of course the basic mechanisms of scrying. Scrying is a shift in the locus of consciousness. The Golden Dawn teaches the individual to scry in a manner which is similar too, and in fact connected to, their instructions in astral projection. The key differences seem to be the level to which the magician's locus is shifted. In astral projection some piece of the magician's being is moved into his astrally constructed body so that it may travel through that plane and carry the magician throughout. In scrying the magician likewise extends a ray from himself into the object of his scrying and transfers some element of his awareness along that ray. The magician remains chiefly seated in himself, not merging his being with the scrying device or with the spirits or places being viewed through the device, but rather he moves his focus, his attention, the centrality of his perceptive faculties into communion with the device, so that the device, now Essentially (in the Aquinian sense) the same as the object of the magician's observation, becomes a bridge by which he and the observed may interact. In preparing to learn to scry one needs to develop a certain level of mental control. The ability to focus and to reduce or shut out distraction or wandering thoughts is helpful if not necessary. Crowley's A.'.A.'. system is useful for this. This is not to say that you should go join the A.'.A.'. but check out the “yoga” described in Crowley's works such as Mysticism, within Liber ABA, or the Libers presented in the Equinox which deal with instructions on meditation, yoga, and mental discipline. Prior to working with these an understanding of, and awareness of your own mind might be helpful. Crowley talks a lot about eliminating or destroying un-willed throught, but apprehending and either integrating or resolving the source of un-willed thoughts can be a more complete approach. Exploring some basic forms of Vipasana can help dramatically with this, particular for people dealing with simply the normal distractions and distress of day to day life. If deeper issues are dramatically disturbing your ability to focus, it may make sense to talk with someone who can help with that resolution prior to plumbing deeper into your mind and soul. As one develops mental control a vivid set of mental sensory abilities is helpful. Ben Rowe advocated working in successively more complete mental temples to build these faculties. Entering the active imagination and constructing a temple or a world and working to explore its sensations until it becomes a more and more complete reality. This mental temple may be useful for a lot of things, but for our purposes it is primarily a means of getting your mind comfortable with fully perceiving constructs of mental awareness. The ability to transition awareness is a significant, perhaps the most significant skill needed by a scryer. In general our experience of the world is based on an awareness focused around our eyes and ears. We know the world from the perspective of our heads, both in terms of it interpreting what we sense, but also in that we feel our thoughts as if they are in our heads; we interpret the world primarily from sensations which are tied to our heads. This is where our focus and awareness is. But could our thoughts, and our main locus of awareness take the perspective of coming from our hands, or our feet, or some other part of our bodies? Can we focus on those parts to the point where our experience is from that perspective? Yes. This is one of the simplest means of transferring perspective because it is still our own perspective we're dealing with. Can we then expand our perceptions of ourselves to encompass objects with which we are in contact or with which we are interacting? Can we hold a ball and feel our self image as if the ball is a part of it and as if we are aware of how we are moving or experiencing things as if the ball is part of what we're doing? Again, yes. Here our awareness isn't leaving us, we're not throwing all our being into the ball. We're just expanding our self awareness to include the ball. This is a little harder, but still not too hard. This is a significant part of most training with regularly used sporting equipment. The next and final phase is more difficult, could we move our awareness to the perspective of the ball even if it may not always be in physical contact with us? Again, yes we could. We can make that same move we make with scrying devices and let a ray of awareness enter into the object. This is the actual act of scrying, moving your awareness into the device being scryed, and allowing your awareness to inhabit it such that it perceives that world. From there practice is important, but so is refining your understanding of what you're doing. Explore various spirits and spiritual powers, but make sure also to test your visions and the powers you encounter. Check out more resources that give you insight into the nature of scrying and the nature of the tools involved. As you develop more insight you may also refine your approach to gain better results. In addition to the texts mentioned above I would also recommend Fr. Achad's Crystal Vision through Crystal Gazing, and materials by Florence Farr on the subject. The Golden Dawn knowledge lectures also present good material on this. 2. Develop awareness of your mental focus by recognizing your perspective and being mindful of your experience. For actual scrying. Relax. Set up your device, a bowl of water will do for the beginning. If you have some means to consecrate the device. Use some symbol or statement to define what you intend to observe through the device. Collect your awareness, and visualize a ray of light moving from your head into the scrying device. Move your center of awareness along the ray of light into the device. Then, and this is important but often forgotten in descriptions. Let go. Don't force the vision, don't desire the vision, don't question your capability. All of these things are distractions. Just breathe, relax, and dissolve. Let your awareness become diffuse within the scrying device. Let your focus stay within your work but relax it to a somewhat passive focus and allow yourself to be receptive and receive the connection. Test your visions. Record the results.